The simplest and most intuitive way of dating geological features is to look at the relationships between them. There are a few simple rules for doing this, some of which we’ve already looked at in Chapter 6. For example, the principle of superposition states that sedimentary layers are deposited in sequence, and, unless the entire sequence has been turned over by tectonic processes or disrupted by faulting, the layers at the bottom are older than those at the top. The principle of inclusions states that any rock fragments that are included in rock must be older than the rock in which they are included. For example, a xenolith in an igneous rock or a clast in sedimentary rock must be older than the rock that includes it (Figure 8.6). 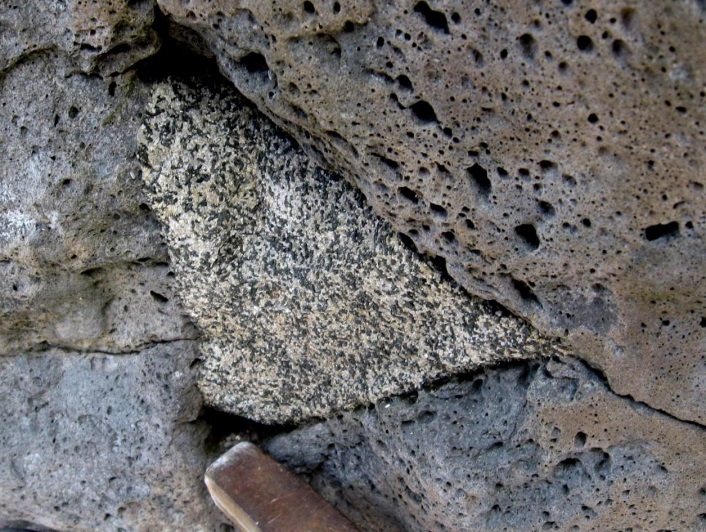 The principle of cross-cutting relationships states that any geological feature that cuts across, or disrupts another feature must be younger than the feature that is disrupted. 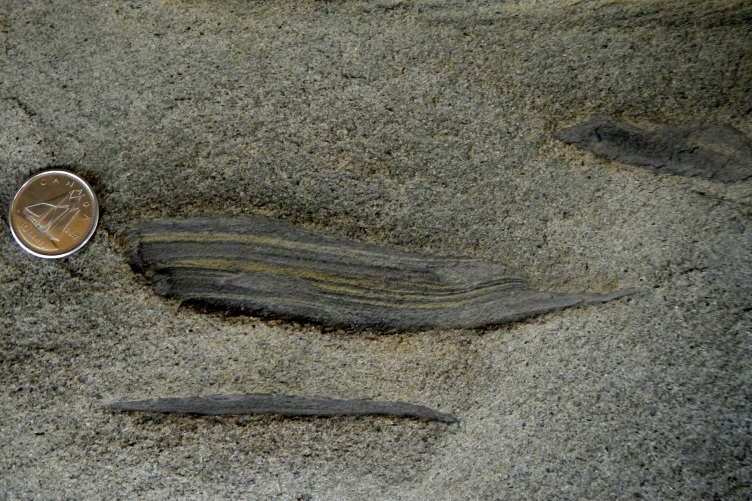 An example of this is given in Figure 8.7, which shows three different sedimentary layers. The lower sandstone layer is disrupted by two faults, so we can infer that the faults are younger than that layer. But the faults do not appear to continue into the coal seam, and they certainly do not continue into the upper sandstone. So we can infer that coal seam is younger than the faults (because it disrupts them), and of course the upper sandstone is youngest of all, because it lies on top of the coal seam. An unconformity represents an interruption in the process of deposition of sedimentary rocks. Recognizing unconformities is important for understanding time relationships in sedimentary sequences. 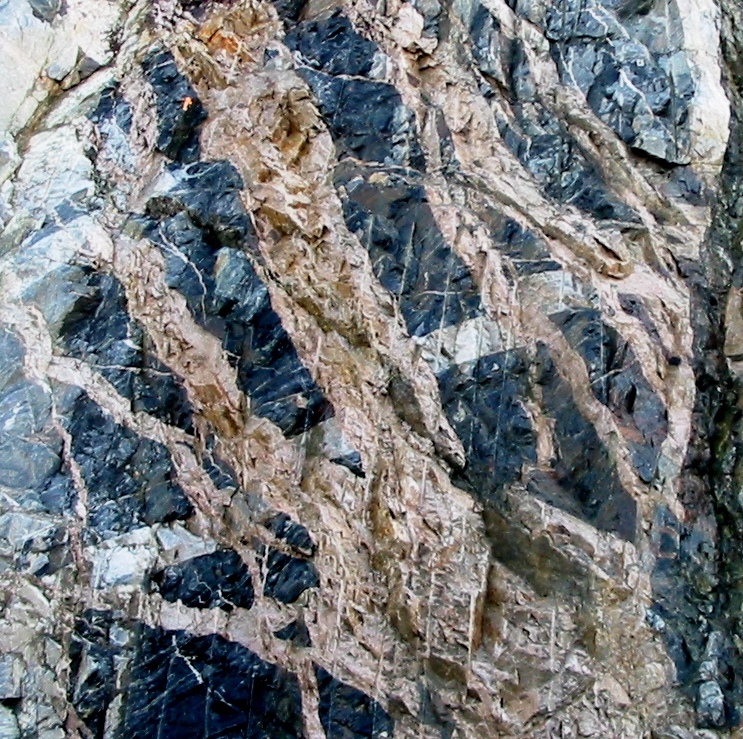 An example of an unconformity is shown in Figure 8.8. 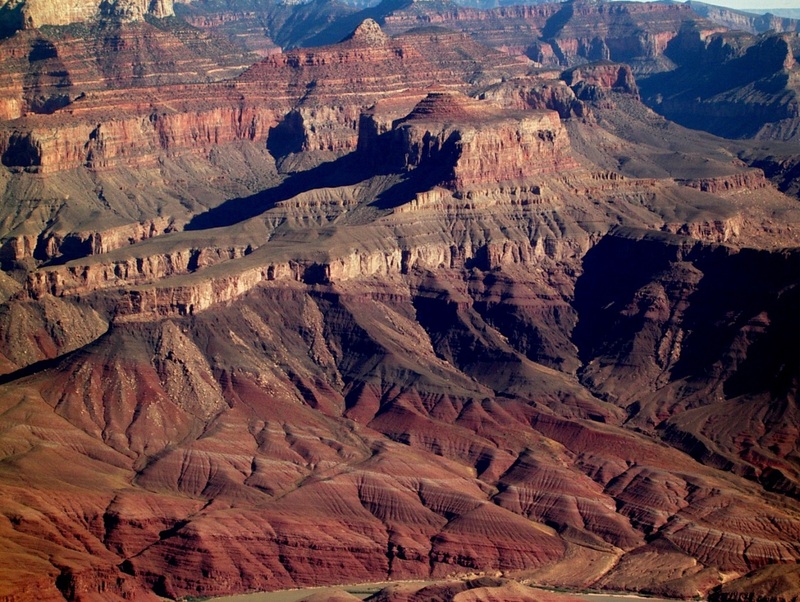 The Proterozoic rocks of the Grand Canyon Group have been tilted and then eroded to a flat surface prior to deposition of the younger Paleozoic rocks. The difference in time between the youngest of the Proterozoic rocks and the oldest of the Paleozoic rocks is close to 300 million years. Tilting and erosion of the older rocks took place during this time, and if there was any deposition going on in this area, the evidence of it is now gone. 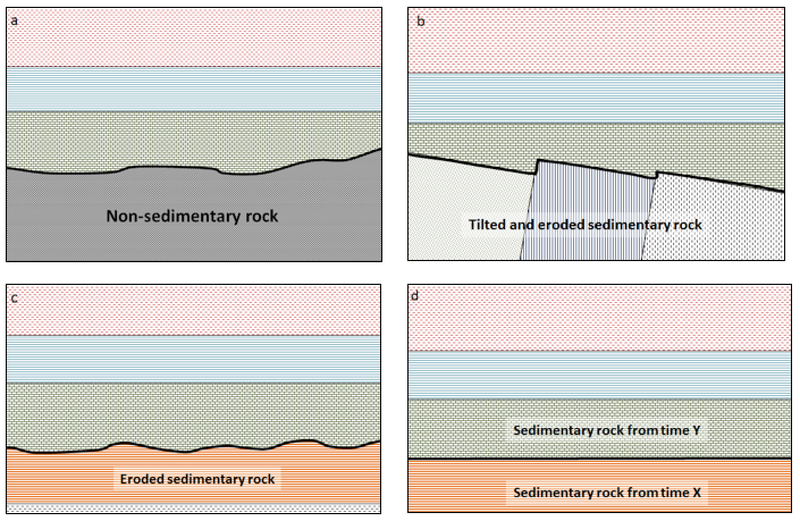 There are four types of unconformities, as summarized in Table 8.1, and illustrated in Figure 8.9. 8.2 Relative Dating Methods by Steven Earle is licensed under a Creative Commons Attribution 4.0 International License, except where otherwise noted.